Dawson Prough, Owlett headline NTL baseball All-Stars. Hornet baseball falls to Loyalsock in D4 playoffs. Wellsboro baseball falls to Milton, 14-1. Hornet baseball falls to Athens, 9-0. Hornet baseball falls to Troy. Hornet baseball drops Williamson, 16-2. Hornet baseball falls to Athens. Hornet baseball tops NEB, 11-4. Hornets fall to Canton, 9-4. Hornet baseball tops CV, 14-3. Hornet baseball falls to Canton, beats Sayre. Hornet baseball takes 2nd at Giles Tournament. Prough drives in winning run to beat Canton. 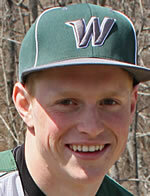 Hornet baseball ten-runs Williamson in 5 innings. Hornet baseball scores 11 runs to defeat CV. Hornet baseball falls to Mansfield. Hornet baseball explodes for 15 runs against NEB. Shaw's 3 homers power Wellsboro past Troy. Owlett strikes out 14 in 2-1 win over Sayre. Hornet baseball falls to Towanda. Hornet baseball tops Athens, 5-2. Hornet baseball suffers loss to Canton. Hornet baseball shuts out Galeton. Hornets blank Mansfield in 5 innings. Perry pitches Waverly past Notre Dame. Notre Dame baseball rolls past Edison. Wellsboro splits a pair at Montoursville Tournament. Wellsboro baseball holds off Canton. Canton clinches share of NTL West title with win over Mansfield; Waverly forces divsional playoff. Sullivan County qualifies for districts with win over Montgomery. Sullivan baseball rallies past Bloomsburg; Tioga tops ND. Canton no hits Athens; Waverly falls to Newark Valley. Mansfield rallies past Sayre; Wellsboro tops Athens. Athens rallies past Wyalusing; Waverly, NEB, Wellsboro get wins. Wellsboro blanks Coudersport; CV falls to Oswayo Valley. Ripic's walk-off blast lifts Knights to win. Canton coach Rockwell gets 300th win. Towanda tops Sayre; Wellsboro, Wyalusing, Mansfield get wins. Lyons leads Sayre past Athens.